DULLES, Va.Feb. 11, 2016-- Orbital ATK (NYSE: OA), a global leader in aerospace and defense technologies, played a vital role in Wednesday s successful launch of a United Launch Alliance Delta IV rocket from Vandenberg Air Force Base, California. 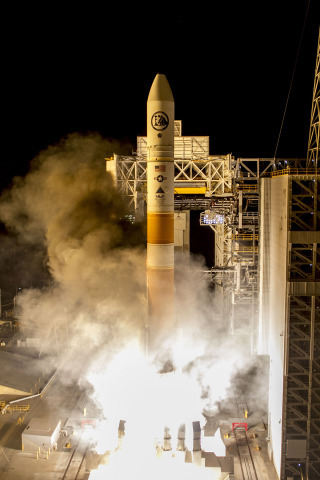 The rocket launched a classified satellite, designated NROL-45, for the U.S. National Reconnaissance Office (NRO) in support of a national defense mission. Orbital ATK s contributions to the Delta IV include cutting-edge technologies from across the company. Contributions include two Graphite Epoxy Motors-60 (GEM-60), large composite structures and the propellant tank and nozzle for the main engine. Congratulations to the entire team on the launch of the NROL-45 satellite. said Scott Lehr, President of Orbital ATK s Flight System Group. Orbital ATK is honored to support the NRO and ULA with key technologies that enable the launch of critical national defense satellites. Orbital ATK provided two 60-inch diameter Graphite Epoxy Motors (GEM-60) for the Delta IV rocket. The 53-foot-long solid rocket boosters burned for 90 seconds and provided more than 560,000 pounds of thrust. Orbital ATK produced the solid rocket motors at its Magna, Utah facility, where it has manufactured 76 GEM-60s for the Delta IV launch vehicle since the initial flight in 2002. Beginning in 2018, Orbital ATK will provide upgraded GEM-60 solid rocket boosters, designated GEM-63 and GEM-63XL, for ULA s Atlas V and new Vulcan launch vehicles, respectively. Orbital ATK also supplied 14 Delta IV and GEM-60 key composite structures, which provide lower weight and higher performance. The largest composite structures are five meters in diameter, range from one to eight meters in length, and are produced using either advanced wet winding or hand layup, machining and inspection techniques at Orbital ATK s manufacturing facilities in Iuka, Mississippi, and Clearfield, Utah. Additionally, Orbital ATK manufactured the propellant tank for the Delta IV upper stage roll control system at the company s Commerce, California, facility, and designed and manufactured the nozzle for Delta IV s RS-68A engine at its Promontory, Utah, facility. Orbital ATK also designed and produced the nozzle s thermal protection material, which is capable of shielding the nozzle from the extreme heat of launch, when external temperatures can exceed 4,000 degrees Fahrenheit.